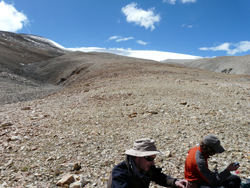 LAWRENCE — In the most comprehensive study of its kind, University of Kansas geologists have unraveled one of the geologic mysteries of Tibet. The research, recently published online in Nature Geoscience, shows that it is the northward movement of India, thrusting under Tibet’s surface like a shovel pushing through a winter’s snow, that is causing the largest and thickest mountains on Earth to stretch in the east-west direction. The paper is the work of Mike Taylor, associate professor of geology, and two of his former students, Richard Styron and Kurt Sundell. The lead author, Styron, now heads Earth Analysis, a consulting firm in Seattle. At 1,000 kilometers in width and 1,500 kilometers in east-west length, the Tibetan plateau is the largest continental mountain belt on Earth. 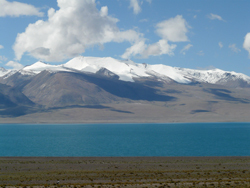 The plateau is bordered to the south by the Himalayas, which include the Earth’s tallest mountains. Geoscientists have puzzled over the mechanism that created the two and how they began to stretch and move today, but many factors have hampered research, including the region’s remote location. To reach their research sites, KU geoscientists traveled to Lhasa, the capital of Tibet, then made a two-week drive by jeep farther into region's interior. The team studied the mechanism that formed and continues to mold the mountains by collecting and analyzing rock samples. Sometimes hiking nearly 14 miles across a single mountain range and back, they collected more than 60 samples from a long rift valley that cuts the Tibetan plateau and forms large mountains with extensive granite exposures. Granite is an igneous rock that forms when magma cools and solidifies at relatively deep depths. By analyzing a common mineral found in granite called zircon, the team determined when the rock cooled, which allowed them to date when the formation of the mountains exhumed the zircon from the Earth’s hot interior and brought it to cooler regions near the planet’s surface. The geoscientists found that the zircon samples began to cool about 15 million years ago, which is when Tibet began “stretching” in the east-west direction. By running thousands of computer models on their data, they discovered that the modern rift valley first formed in the south and then propagated northward, much like a zipper ripping open. The rate at which this massive zipper tore Tibet apart was 15 millimeters per year and continues today, a rate that is strikingly similar to the rate at which India is being shoved under the Himalayas. By comparing their work to previous geophysical studies of Tibet’s deep interior, the authors concluded that the acceleration of the rifting could be attributed to the insertion of India underneath the Tibetan plateau. Taylor’s team is now focusing its research efforts on Nepal and the Andes. 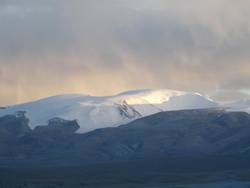 The National Science Foundation, American Chemical Society and the General Research Fund of the University of Kansas funded the Tibet project.